I apologize for the delay. It’s been over two weeks since my last post, and I haven’t replied to anyone’s comments or emails. Part of the reason is that I billed over 30 hours last week on this new software-development job, a heavy week for an off-site contractor. (I’ll have to explain to you the math of billed contractor hours versus employee hours sometime.) And I’ll probably bill about 30 hours this week, too. In between those hours—at least last week—I spent numerous hours taxiing the family around, my Beloved to and from work, my daughter C to and from school. I would get up in the morning, drive around, and get home just in time to start working with the guys at Client Z, out on the west coast. That’s because we had one working car, and it wasn’t even ours. Mike finally got back to me, told me the cable connecting the shifter to the transmission had broken, and to replace it would cost over $400. We had also asked them to look into why the car tended to overheat in stop-and-go traffic; new radiator fan, over $200. The final bill came to $655 and change, money we didn’t have. Fortunately, I have a better relationship with my parents than Lorelai Gilmore has with hers, and I wasn’t too embarrassed to ask them for a loan. If this had happened next month, after my first invoice had been paid on the software-development contract, I would have had plenty of cash. But writing doesn’t pay as well as you might imagine (in your dreams), and money has been tight. Mom and Dad opened up their checkbook, and we were able to get the Saturn fixed. Kinda. Sorta. Skipping ahead in the story, it took several days for them to get the parts in for the shifter repair. And then it still didn’t quite work right. It still gets stuck in gear, and sometimes out-of-gear, too. Truthfully, shifting has been hit-and-miss for a while, but it’s always seemed manageable to me. (Maybe it’s the way I drive.) We imagine that it got stuck in gear, and when my Beloved tried to shift, the cable broke. I finally got the car back, a week and a half after it broke down. And while the shifter does work, I can also reliably make it stick in gear. I also know how to get it unstuck. The gang at Long Life Auto thinks it may be the transmission, the clutch, or maybe one of the hydraulic cylinders controlling the clutch (preventing the clutch from fully disengaging). I don’t know yet how much it would cost to replace the cylinder, but anything else on that list would surely be a pricey bill for a 12-year-old car. For now, I alone am using the car, and only for occasional, local driving, which is all I needed it for anyhow. While the Saturn was in the shop, I was prepared to rent a car (using money we did not have). But my friend Tony (not his real name) had an extra vehicle, a small pickup truck he uses in his plastering business. Unfortunately, he had loaned the truck to his daughter, while her car was down at Mike’s. (Ah! So that’s why Mike couldn’t look at my car! <g>) However, Tony’s daughter’s husband loaned his car to Tony, so that Tony could loan his SUV to his wife, so that she could loan her car to my Beloved and me for a few days. Somehow, they managed to pull that together within 10 minutes of discussion without getting hopelessly confused. And after the daughter got her car back from the shop, they unwound the chain, and Tony loaned us his pickup over the weekend. So I doubly owe them. Then Mom and Dad threw a curve ball at us. Apparently, they felt bad that they had bought two cars for my brother during his life, and also paid for his wedding rehearsal. And they helped my other brother and his wife buy a house. And all they had ever done for me and my Beloved was to patiently bear with my snotty teenage independence. Actually, they also helped me out after I had totaled my new Geo Prizm in the winter of 1990. And they’ve been incredibly supportive of my writing career, such as it is, even though they may not realize how important that support is to me. So Mom and Dad threw us a curve ball. Long story short: they bought us a car. 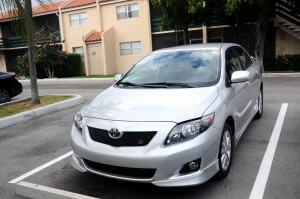 It’s a 2010 Toyota Corolla LE with about 10,000 miles on it, probably a corporate lease before we got it. The car pictured above is not ours, but ours is indeed silver, so it was really easy to find an online photo that looks just like it. Yes, I am now officially part of the lowest common denominator. Another Car Bites the Dust? I actually haven’t gotten around to taking a picture of our new Toyota yet, but I understand that it’s already gotten into an accident with an SUV, in the parking garage at the doctor’s office. I haven’t seen the damage (if any), but… I had my Geo Prizm only a few months before I totalled it on I-95, and if you recall, the Prizm was essentially a rebranded Toyota Corolla. In fact, today’s Corollas still remind me of my old Prizm. That’s why I say, God sometimes has an ironic sense of balance.